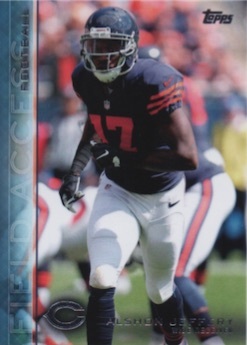 With a heavy focus on action photography, 2015 Topps Field Access Football brings collectors even closer to the game. Each box includes four autographs. 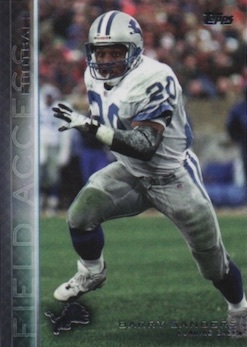 Featuring full-bleed images, the 200-card base covers a wide mix of rookies, veterans and retired players with action shots. The simple design relies heavily on the image, with only a simple strip along the side and minimal text. Parallels add a basic color difference with Blue (2 per pack), Gold (#/99), Green (#/50), Purple (#/25), Red (#1/1) and Printing Plates (1/1). 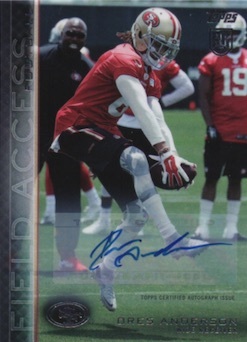 Utilizing the base design in 2015 Topps Field Access Football, Autograph Base Cards feature a sticker signature and a variety of parallels. This includes Gold (#'d), Green (#/50), Purple (#/25), Red (#1/1) and Printing Plates (1/1). Collectors can find more limited options with Short Print Autographs that drop one per case. Additional themes are present in the insert sets that feature passionate moments and less-common vantage points. 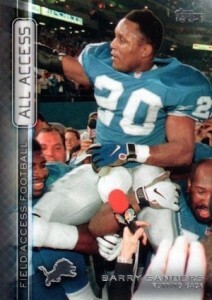 All Access includes 50 cards that feature unique images of familiar names. 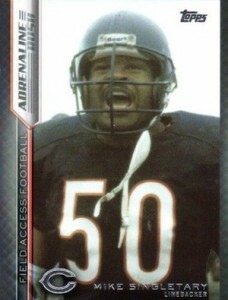 Running along the same lines, Adrenaline Rush showcases the emotions of the game with another 50-card set. Both inserts include Blue, Gold (#/99), Green (#/50), Purple (#/25), Red (#1/1) and Printing Plates (1/1) parallels. There are also limited Autographed versions of both inserts, along with a one-of-one Red parallel. Good: Appealing base design, some impressive images, four autographs per box. 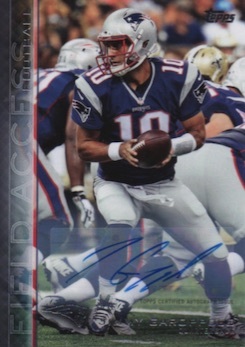 Bad: Huge autograph checklist with many weak names, one-note feel, very odd base set configuration. The Bottom Line: When the term “sticker dump” is frequently applied to a product by collectors, that is never a great thing. On one hand, the design is strong and the potential is there for several key names, but it only takes a quick look at the full list of signers to see the huge risk associated with this sticker-filled product. 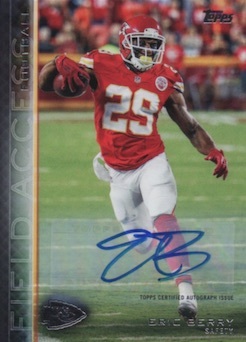 The base design is the clear strength of 2015 Topps Field Access. It sort of reminds me of the flagship Upper Deck base design of few years back (maybe 2009-10 basketball?) given the simple layout, high-gloss finish and rich-color images. There are also some really impressive photos, especially for the retired players. I realize that not everyone cares about the backs, but they are different than the norm with basic info and measurements accompanied by four positive attributes for each player. 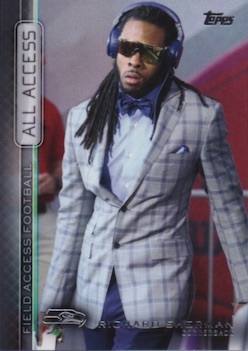 Beyond that, 2015 Topps Field Access Football is a very one-note product. Simple parallels change the banner color and even the inserts do little to separate themselves. The only hits come as sticker autographs on the base design. The set honestly feels like it was once intended to be a full-fledged release and was instead flipped to the base-only, autograph-per-pack format at the last minute. I would have liked to have seen it as a late-season flagship-style release with several inserts. Make no mistake, this is a very odd checklist. The 200-card base set has doubles and triples for several players and not even the names you would expect. Triplicates include Allen Robinson, Eric Ebron, and Nelson Agholor. The huge autograph checklist nearly mirrors the base set and there are definitely some head-scratchers in the group. While there are also several Hall of Fame players and current stars, there are a ton of less desirable autographs in play. Since the base autographs are not numbered, there is no indication as to which are the short prints and how short-printed they actually are. This can lend itself to some very bad breaks. Four autographs for $50-70 is not terrible in principal, but once you account for the stickers and the low-end checklist, it is still an extreme gamble even at that price. With so many one-to-two dollar autographs to be pulled, the best case scenario is snagging one of the few short print veteran or retired player autographs. Given the odds are stacked heavily against that, tread lightly. Like I said, the base design is strong and that made the box experience more enjoyable for me. Stickers detract from the fun, for sure, but it is never ideal to pull an autograph and say, “who is this fella?” I’m looking at you, Dres Anderson. The feeling of an unfinished release ultimately hurt the fun the most for me as I could sense the potential was there. 2015 Topps Field Access Peyton Manning auto numbered 15 25 card! 2015 TOPPS FIELD ACCESS JAMEIS WINSTON RC AUTO!! Will this product be in Retail format? David D. � Not sure. There was nothing mentioned on the sell sheet about it being hobby only. David D. � Thanks for letting us know. Is there any reason there are double of a lot of players in the base set? Matt � I checked with Topps and the list is accurate. Not sure why there are double and even triples for some players. That definitely seems odd because there are a few big name players missing from the set and the Ravens only have 4 cards in the whole 200 card set. They also don’t have any inserts either, but there are 3 Richard Rodgers and Eric Ebron cards. Along with doubles of about 7 or 8 players. Correction, there are only 2 Richard Rodgers cards but they do have 3 Nelson Agholor cards. Matt � Yep, I saw that as well. Seems odd to me too. I guess this is topps’ panini signature series? Just trying to dump off sticker autos they won’t use anymore imo. I saw some of these and almost caught the plague!!! It’s an ok product but kinda pricey for getting autos that hold the same value as topps fire or topps valor. What are the SP autos? any idea how to tell them apart? I pulled a magenta printing plate of Marvin Jones 1-1. does anyone know what its worth ? I never got one before. Just pulled a Payton Manning adrenaline rush printing plate, anyone know what it’s worth? 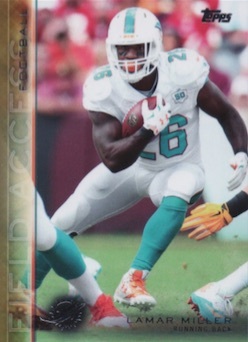 Did anyone notice how they put Damian Williams auto on a Damien Williams card? Picked up a Hobby Box on sale last week. A Jameis Winston Purple auto #/25 was the big highlight for me. Over all I find Field Access to be a welcome diversion if you’re looking for something outside of the more mainstream releases. The price point is middle of the road considering you can spend about the same amount of money for a basic 24 pack hobby box or a single pack higher end line. The amount of ink and “hits” per box makes me feel as if I’m actually getting my money’s worth for a change. The card design isn’t all that impressive and doesn’t take your breath away but it works. The cards have a nice quality about them that other sets lack (Archives….). When you can get multiple packs and multiple hits out of one box without having hundreds of left over cards to deal with its a win for me Everytime. In back to back breaks of this product, my buddy hit an Aaron Rodgers auto /5, and I hit a Jerry Rice auto /25. 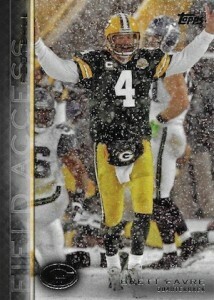 (Unfortunately, I’m a Packers fan & so is he!) So I am very high on this product at this price point. Sure there are lots of duds in this, as with any product, but there are also huge names.